We’d love your help. Let us know what’s wrong with this preview of Out of the Whirlwind by Chris Hambleton. History affirms that man learns nothing from history. The Flood has ended and has left behind a cleansed, new world eager to be replenished. After the Great Scattering at Babel, the tribes of Noah's three sons have been driven to every corner of the earth. Yet the old struggles, the old disputes, and the old questions remain. Fifty years after Babel, the fledgling clan of History affirms that man learns nothing from history. The Flood has ended and has left behind a cleansed, new world eager to be replenished. After the Great Scattering at Babel, the tribes of Noah's three sons have been driven to every corner of the earth. Yet the old struggles, the old disputes, and the old questions remain. Fifty years after Babel, the fledgling clan of Joktan has settled in the fertile grasslands of Uz to the west of Shinar and slowly begins to take root, but some of his sons are impatient to acquire honor, and lands of their own – and gold. With endless fields and pastures to fill their days, their future looks rather bleak. And then they meet a trader who tells of mines and rivers glittering with gold. 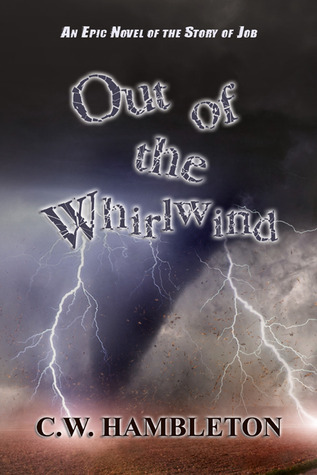 To ask other readers questions about Out of the Whirlwind, please sign up. I was drawn to Out of the Whirlwind by Chris Hambleton because it was inspired by the Book of Job in the Old Testament. The high poetry of the Book of Job has always moved me, especially when God speaks to Job out of the whirlwind. "When the morning stars sang together, and all the sons of God shouted for joy?" is one of my favourite lines from the Book of Job. I like the illustration by William Blake inspired by that line in which God speaks of the song of his angels. The Book of Job, the Book I was drawn to Out of the Whirlwind by Chris Hambleton because it was inspired by the Book of Job in the Old Testament. The high poetry of the Book of Job has always moved me, especially when God speaks to Job out of the whirlwind. "When the morning stars sang together, and all the sons of God shouted for joy?" is one of my favourite lines from the Book of Job. I like the illustration by William Blake inspired by that line in which God speaks of the song of his angels. The Book of Job, the Book of Psalms and the Book of Isaiah are the three books in the Old Testament which contain high poetry, I think.